Posted on Friday, March 16th, 2018 at 8:58 pm. 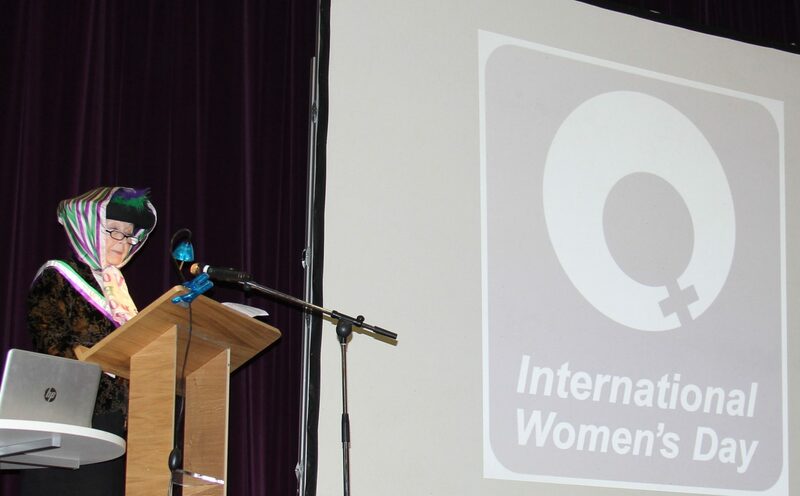 Soroptimist International of Slough, Windsor & Maidenhead, Thames Valley and High Wycombe and District Clubs hosted an event in Maidenhead to mark International Women’s Day and the centenary of votes for (some) women in the UK. The event was a great success with 70 attendees from a number of local women’s organisations, even though it was Mother’s Day. 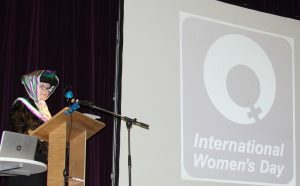 Soroptimists were there from Newbury, Oxford, Greater London and Tiverton in Devon as well as from the organising Clubs. We also had two Mayors and two Mayoresses in attendance, including Margaret Lenton who chaired the event. Pictured above, dressed as on the day are Jen Simpson from SI High Wycombe and District, Jackie Paling from SI Slough, Windsor and Maidenhead and Irene Cockroft (also in the promotional picture). Irene was a keynote speaker – please see the notes below. It was great to see Jen and Irene in the costumes for Women’s suffrage 100 years ago. 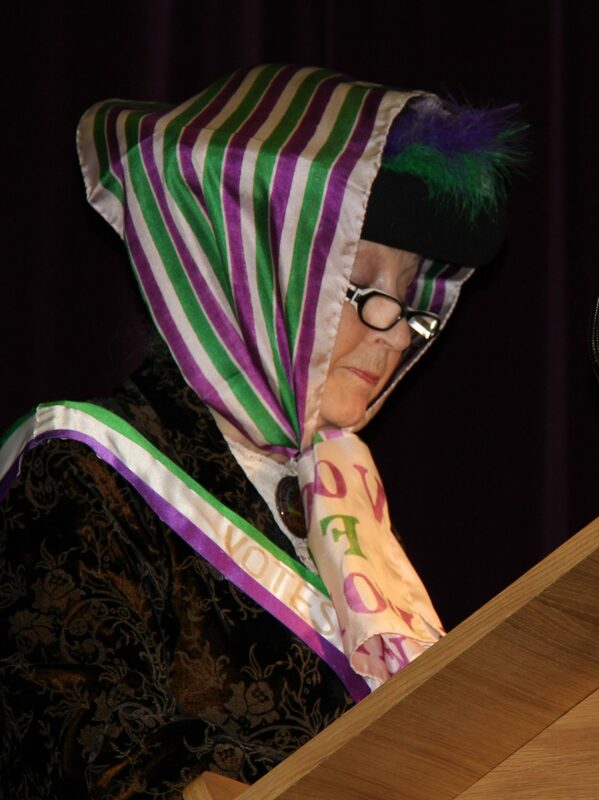 “Irene Cockroft , a member of Soroptimist International Greater London, London Chilterns Region since 1997, is an independent exhibition curator, author and lecturer specialising in the history of women’s involvement in the late 19th, early 20th century Arts & Crafts and Suffrage movements. Irene’s inspiration in studying women’s history was her great-aunt, suffrage artist Ernestine Mills (1871-1959) who worked in many mediums including highly-skilled enamel-on-metal. Mills was a founder member of Soroptimist International of Greater London, chartered in 1924. Greater London was the first Soroptimist club to be chartered outside America where the movement began in 1921. Mills designed and enamelled Votes for Women brooches sold at Society of Women Artists exhibitions. She also designed and enamelled presidential insignia for Greater London and for several other early SI clubs. Ernestine’s medical doctor husband Herbert Mills, was physician to the militant Pankhurst family and to Lady Frances Balfour, leader of the London Suffrage Society that sought to achieve Votes for Women through peaceful advocacy. Ernestine was a member of both the militant and the law-abiding societies, the leaders of which were family friends. Irene’s book, New Dawn Women, published by Watts Gallery, illustrates the link between Arts & Crafts training for women and propaganda for women’s human rights. Another book, co-authored by Irene with Susan Croft and published by Aurora Metro Press, covers Art, Theatre and Women’s Suffrage. Both books are available on the Amazon website. For a Soroptimist discount whilst stocks last, please email: newdawnbooks@virginmedia.com.